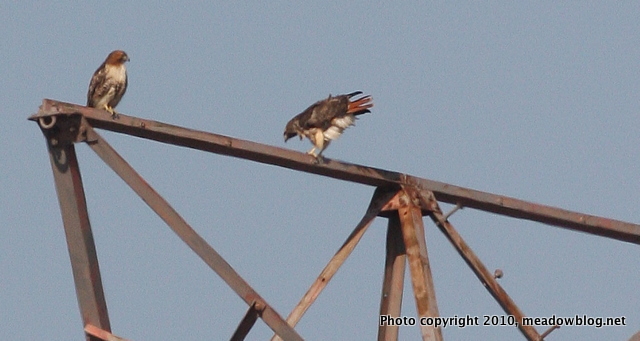 Although we did not see the shrike, we did a young Cooper's Hawk, and a Peregrine Falcon had been seen a bit earlier, along with four Redtails and assorted Northern Harriers. Northern Shrike continues. Seen from 10:20 to 10:35 a.m. near the northern end of the Saw Mill Creek Trail (off Disposal Road) between the first and second utility tower islands. More specifically, bird perched for a good while in the tallest scrub tree just after the blue bench, north of the second utility tower. Shrike first seen as it flew, in a very low and direct flight from the direction of the Visitors Center, all the way across the frozen impoundment (just above the icy surface) to the utility island, where it attempted to catch off-guard some of the song sparrows there. Shrike seen again briefly behind the AMVETS Carillon in the sumacs. Here again, it pursued an alert little brown job. While perched, shrike twice gave a raspy, creaky call of four short notes. Then dove into the underbrush. Also seen in the sections of the impoundments not frozen over: good numbers of Canvasbacks, Bufflehead, Mallards and Black Ducks. Fewer Pintail. Fewer yet (half dozen) Gadwall. Viewing conditions this morning very good (no wind, overcast/no sun glare, no rain). At the southern end of the Saw Mill Creek Trail, amid the thrumming NJ Turnpike western spur, were two drake Red-breasted Mergansers and a single imm. hen Common Goldeneye. Also of note, a single Green-winged Teal (the first I've ever seen next to a Canvasback). On the way out, at the dog-leg on Valley Brook Ave., a male Kestrel sat atop a utility pole. Last we checked, the Northern Shrike was last seen on Friday morning (Jan. 15) at the Retention Pond on Disposal Road. It has been seen an amazing 28 or 29 of the last 36 days, which we understand, is darned good as shrikes go. Of late, the shrike has been really tough to find). Once shrikes establish their territory, they tend to expand it, so the shrike could be anywhere within, say, a half-mile of the Retention Pond. 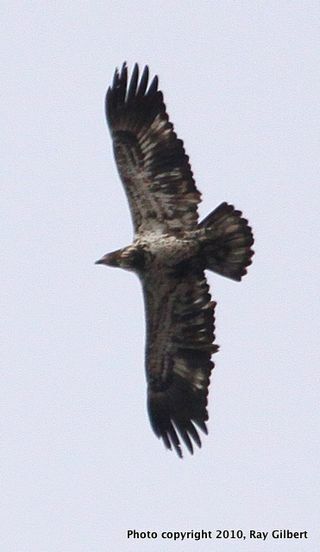 For example, it was reportedly seen Thursday afternoon in DeKorte Park's Lyndhurst Nature Reserve. 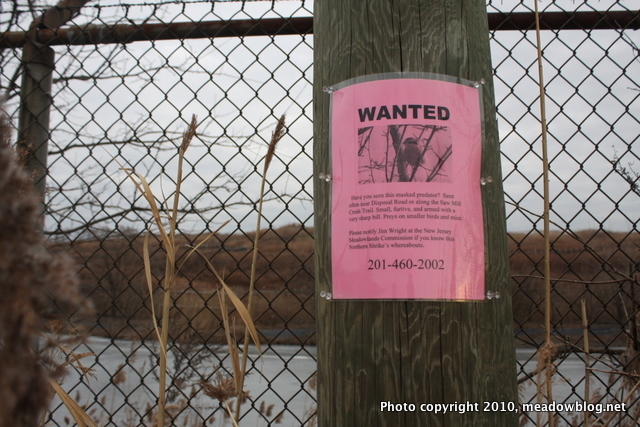 We even put up this new "Wanted" poster for shrike watchers. First line: "Have you seen this masked predator?" If you see the shrike, please e-mail Jim Wright here. He checks e-mail daily, including weekends. We weren't the first to notice that the Redtails of North Jersey seem to be getting into Valentine's Day mode about a month ahead of time, but we did get our camera ready. 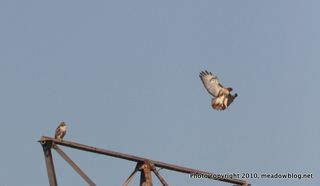 These two Redtails decided to hang out together on a high-tension wire tower by Disposal Road for a few minutes before flying off in tandem toward Valley Brook. 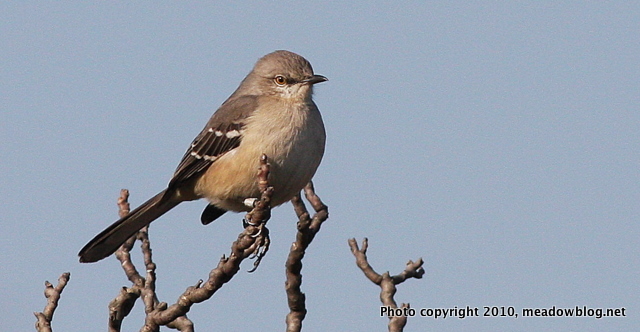 We saw this Northern Mockingbird in Harrier Meadow on Thursday, and a little birdy told us this guy was wearing a band. Sure enough, we found a band on its right leg. Since the bird was spotted less than 200 yards away from where NJMC Naturalist Mike Newhouse banded 15 Northern Mockingbirds this past fall, we think this guy might be a local yokel. Just a guess. Click here to see the totals for the Fall 2009 banding project. Click here for deja vu.